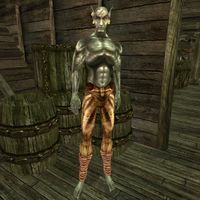 Jiub was originally a freelance assassin, who murdered to pay for his skooma addiction. He was eventually caught by the authorities, when he was paid to assassinate a high-ranking official from House Redoran. However, the Morag Tong had also been hired to kill him, and Jiub's rival assassin had called the guard to cover his tracks. Jiub walked into the trap, and was taken into custody. He was tried for murder and imprisoned in Vivec City. At some point in his imprisonment, he was taken from Morrowind, and likely moved to the Imperial Prison, in the Imperial City. In 3E 427, Jiub and a fellow prisoner were put on a prison ship and sent to Morrowind. His fellow prisoner was the Nerevarine, who had been sent to Vvardenfell at the request of Emperor Uriel Septim VII. Both prisoners were freed in Seyda Neen. Jiub, wanting to make up for his dark past, sought redemption by serving the people of Morrowind. He made it his mission to eradicate the Winged Menace, the cliff racers who plagued the roads of Vvardenfell. It took years to hunt them all down as he traveled Vvardenfell atop a silt strider, but in a final battle in the ash wastes, Jiub was triumphant. Vivec, admiring his virtue, saved Jiub from death and brought him to his palace, where he was made a saint. He was hailed as a hero by the people of Morrowind, and earned many titles. Saint Jiub's Fair became a popular celebration, notably in the city of Cheydinhal. Jiub later moved to the Cyrodilic city of Kvatch, where he began work on a twenty-six volume epic to serve as his autobiography. In 3E 433, marking the opening of the Oblivion Crisis, gates to the Deadlands were opened outside Kvatch, and the city was destroyed by the armies of Mehrunes Dagon. Jiub, who was writing in his house at the time of the attack, was soul trapped by a Dremora. His soul was cast adrift in the Soul Cairn, eternally trapped there by the Ideal Masters. For centuries, Jiub wandered the realm, oblivious to his death, thinking he had simply been imprisoned by the Dremora. Rumors of Jiub's death shocked the citizens of Tamriel, many of whom mistakenly believed that he had died in Morrowind. In 4E 201, Jiub encountered the Last Dragonborn, which made him realize that he was dead. Distraught that his name had been forgotten, Jiub urged the Dragonborn to help him write his opus and return it to Tamriel. The Dragonborn retrieved Jiub's notes from the first volume of his memoir, which had been scattered across the Soul Cairn when he was captured. Jiub compiled the notes and gave a copy of the book to the Dragonborn, who presumably returned it to Tamriel so that others would know of Jiub's story. He then continued his work on a second volume, although it is unknown if he ever completed his epic. Jiub appears in TES III: Morrowind, the Dawnguard add-on for TES V: Skyrim, and The Elder Scrolls: Legends. He was only mentioned in TES IV: Oblivion. For game-specific information, see the Morrowind, Skyrim, and Legends articles.